Many thirst, and many are the glasses and lives that are empty and tired that ask to be replenished with meaning.There is much good soil with good seed waiting to be "awakened" from the inexhaustible source of Life that springs from Jesus. Don Bosco is full of the living water of Jesus, a well that provides water to everyone, especially young people, water that gives Life, commitment, and hope. The Samaritan woman: a foreigner, refused, confused, tormented ... She meets with Jesus and everything changes. Jesus, the Source of Living Water. Mary Help of Christians, always careful, who maternally reminds us: "Do what Jesus says." The water of inexhaustible love flows from the ribs and heart of Jesus. The encounter with the Samaritan was in the sixth hour, the same that Jesus died on the Cross when blood and water came out of his broken heart. The task of adults is to collaborate, accompany, cultivate. Water quenches thirst, irrigates, washes, allows seeds to sprout, vivifies, changes the desert into a garden. The Spirit of God works and donates willpower to man. Different ages, different experiences, different races, languages ​​and cultures, but the same humanity, the same thirst, the same intense joy in receiving Jesus as Living Water. The poster is designed by a well-known Spanish artist, Patxi Velasco Fano, who signs his work simply as "Fano", his mother's surname, who when called by her first name is called: "Fe", which in Spanish means 'Faith'. "So I can say that I'm definitely the son of Faith," he jokingly said to Italy's Salesian Bulletin. Married, father of three children, Fano teaches at the elementary school "María de la O" in Malaga, in a context of marginalization and poverty, but full of life, joy and hope. 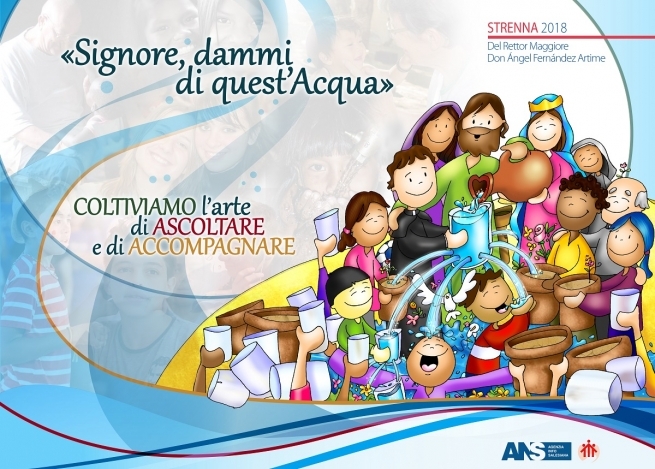 The designer Mauro Borgatello and the Communication Team of the South Italy Province (IME Communication) also participated in the global design of the poster.